LAS VEGAS -- Robert Bosch is expanding its capabilities in two areas that will be crucial to autonomous vehicles: connected parking and high-definition mapping. At a press event here at CES on Monday, Stefan Hartung, a Bosch board member, and Mike Mansuetti, president of Bosch in North America, said the supplier would extend its crowd-sourced parking service out of the pilot phase, to 20 U.S. cities, including Los Angeles and Boston. The company also detailed its recent investment in mapmaker Here, and shorter-term updates on connected vehicle development. "We'll make real-time information about on-street parking available to car manufacturers," Mansuetti said. "Drivers will be able to see on their navigation systems where there's a free space and drive directly to it -- which will save them time, fuel and stress, while reducing congestion and pollution in downtown areas." Bosch's community-based parking approach uses cameras and sensors vehicles to detect and record open parking spaces, storing them on a shared cloud network. When a driver is in need of parking, the car can access that database to find the nearest spot. Though a human driver is still required, such crowd-sourced platforms will serve as a base layer for autonomous vehicles to navigate when they have to drive and park on their own. Another base technology currently under development that will be crucial for autonomous vehicle deployment is high-definition mapping. Bosch recently took a 5 percent stake in mapmaker Here, which is jointly owned by BMW, Daimler and Audi. "We're working on a manufacturer-independent solution for cars to share traffic information collected by their sensors, which can be used to update maps in real time," Hartung said. "We'll also be working together on applications for this technology beyond the automotive domain." Bosch also unveiled its human-machine interface concept at CES, using a voice-controlled assistant and artificial intelligence to keep drivers' eyes off the infotainment screen and on the road. The system attempts to address an issue that will increasingly plague automakers in the short-term: maintaining driver attention as autonomous and connected vehicle development loads the car with more distracting technology. 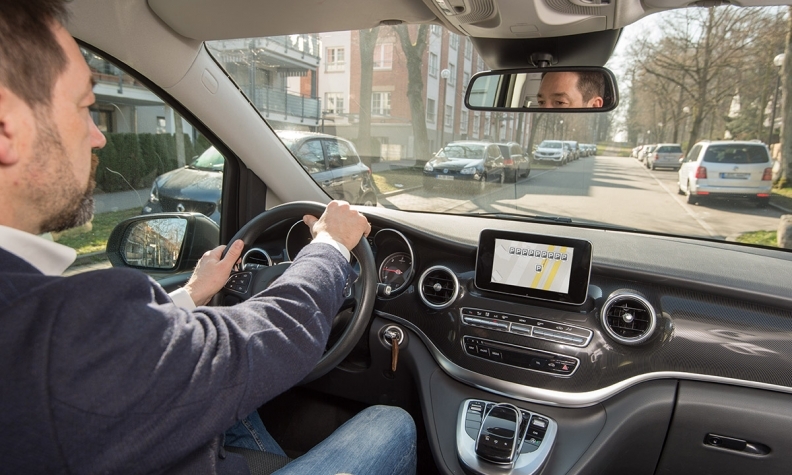 "The more complex the technology in modern vehicles, the simpler and more intuitive control systems need to be," said Steffen Berns, president of Bosch Car Multimedia. Using deep-learning algorithms, Bosch's digital cockpit prioritizes information for the driver, placing necessary alerts, such as road warnings or speed limit changes, in his or her field of vision, and less important communications, such as radio station, on the infotainment screen. The system also uses haptic feedback -- touch screens or gestures that vibrate or buzz -- to allow the driver to access controls that normally require them to take their eyes off the road, like air conditioning or radio controls. "Car displays with haptic feedback are going to catch on," Berns said. "They allow easier operation of all manner of functionalities." Bosch has also added a voice-controlled assistant that operates similarly to virtual assistants such as Amazon Alexa or Microsoft Cortana as another option for eyes-free control. The system initially responds to the name "Casey," though it can be changed to any preferred name, and can speak and understand American, British, Australian and New Zealand dialects of English.